Share this product and receive a $3.98 sharing discount. Amazingly clear resonance sound and quality! 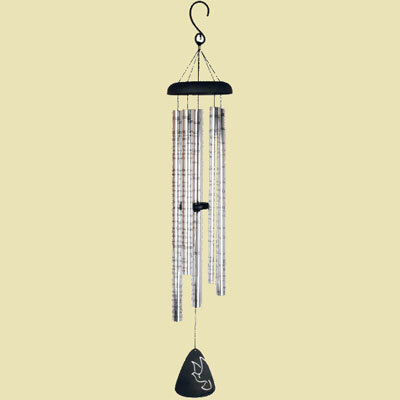 This is from the newest series in the 44" Sonnet Chimes Collection -- which is one of our most successful wind chime collections! The combination of clean sleek lines, adjustable strikers and heavy gauge center-pinned tubes printed with meaningful messages, poems, and songs have made them so. This chime has been inscribed with perhaps one of the most popular Hymns of all time - Amazing Grace. Amazing Grace, how sweet the sound, That saved a wretch like me.... I once was lost but now am found, Was blind, but now, I see. T'was Grace that taught... my heart to fear. And Grace, my fears relieved. How precious did that Grace appear... the hour I first believed. Through many dangers, toils and snares... we have already come. T'was Grace that brought us safe thus far... and Grace will lead us home. The Lord has promised good to me... His word my hope secures. He will my shield and portion be... as long as life endures. When we've been here ten thousand years... bright shining as the sun. We've no less days to sing God's praise... then when we've first begun. Perfect gift for most any special occasion including graduation, ordination, confirmation, and retirement. There are five 1 1/4" diameter tubes. Measures 44" long. 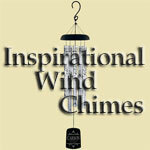 All of the Carson Heavy Gauge Aluminum tube chimes include a unique adjustable striker. By simply pinching the durable spring loaded cinching device and sliding the polycarbonate striker up or down. This allows you to find the range of tones which you like most.